The end is nigh was my first thought. The one nation that has more sheep than people, the one nation where a mutant sheep would be the most dangerous creature to behold on either island now got their hands filled with terrorism, not any kind of terrorism mind you. In this case we see: “Forty-nine people have been confirmed dead after shootings at two mosques in the New Zealand city of Christchurch“, in addition we get “Christchurch hospital is treating 48 people, including young children“. So far we know that the victims are citizens form Pakistan, Turkey, Indonesia, Bangladesh, Malaysia and Saudi Arabia. Four were arrested, one is likely to be innocent, the three others are not, arrested with guns, and one has been positively identified. One of them is not merely a terrorist; he is an Australian making matters worse (for Australians that is). The Guardian (at https://www.theguardian.com/world/2019/mar/15/new-zealand-shooting-what-we-know-so-far) gives us: “A man identifying himself as Brenton Tarrant, a 28-year-old born in Australia, posted online before the attack saying he was a suspect. He posted various images of what appear to be machine gun magazines and a link to what is being described as a manifesto for his actions.” It is not the end, merely the beginning. The Sun (at https://www.thesun.co.uk/news/8649326/east-london-mosque-attack-new-zealand-shooting/) gave us only three hours ago: ‘MOSQUE ATTACK London mosque attack – ‘Racist thug’ calls Muslim worshippers ‘terrorists’ in hammer attack hours after New Zealand shooting‘. This is a growing concern. My personal view is simple, if I have no issue ending the lives of Hamas and Hezbollah terrorists, I will apply the same filter to Christian terrorists and white supremacists. In my personal book they are all equally unworthy. Yet I also look beyond and I was not alone in that. It is seen in the New York Times who gives us ‘The New Zealand Massacre Was Made to Go Viral‘, which is an opinion piece by Charlie Warzel. He (and others) give us: “The act of mass terror was broadcast live for the world to watch on social media” and more important he gives us: “A 17-minute video of a portion of the attack, which leapt across the internet faster than social media censors could remove it, is one of the most disturbing, high-definition records of a mass casualty attack of the digital age — a grotesque first-person-shooter-like documentation of man’s capacity for inhumanity“, as well as “what makes this atrocity “an extraordinary and unprecedented act of violence,” as Prime Minister Jacinda Ardern described it, is the methodical nature with which it was conducted and how it was engineered for maximum virality“. There are two sides to that. Nothing is that well engineered off the bat. It implies that this was not merely staged; this was long contemplated on how to execute the event for maximum footage; to give rise to that I need to take you to the setting of a movie to illustrate the issue. The movie Russian Ark used 2000 actors, was shot in 32 locations in one place (the Hermitage), all were rehearsed; all were on queue including three complete orchestra’s. Yet the big element is missing, the entire 97 minute movie was done IN ONE TAKE. A titanic, almost impossible feat was shown by Alexander Sokurov. It was a stage that took months of preparations to get it all in one take. Now we go back to New Zealand. As we are exposed to ‘the methodical nature with which it was conducted and how it was engineered for maximum virality‘, some might consider the part behind this. That person was not alone in the planning; he had help and a decent amount of it. Apart from the shooting which most people can do in a video game, the setting of the locations, the actions taken as well as the stage of filming and making it stream live. All elements that one person needs to plan for, we should consider what was done ‘behind the screens’. If you ever get into a situation like that your body will be so pumped with adrenaline, the acts we see with “In minutes, the video was downloaded and mirrored onto additional platforms where it ricocheted around the globe. Screen shots were created from still frames of bodies and uploaded to sites like Reddit, 4chan and Twitter where they were shared and reshared“. The perpetrator could not have done this to that degree, as I said earlier; he had support and a decent amount of it. Most people who want to get viral know of the machines available to them, some employ them for marketing and other options, yet what I see here is that this was an attack that had been thought through, I might go as far as speculating that he never expected to get away with it, as long as it hit the internet. That is seen when we look at the CNN quote: “there were just 36 minutes from the time police received the call about shots fired until they had the offender in custody“, I would contemplate that no police force in the world is that effective, but the readers might misinterpret that, and this is not about making some cheap jab at the police. Part of my thought is seen to some extent in the Guardian (at https://www.theguardian.com/world/2019/mar/15/i-couldnt-save-my-friend-carnage-leaves-christchurch-stunned). It is the step list. He walks into the mosque through the front door then moves from room to room firing. Gunman leaves at least once to rearm. Gunman shoots people in the street, before driving off. He rearms? I have walked around (in my far military past mind you) holding 4 FN FAL clips, each having 30 bullets giving me a 100+ kill option, and this guy rearms? Something is not on the right rails, the man is guilty, there is no doubt about it, but all I see is ‘patsy’ (a murdering patsy mind you) he was used to start something. Even as the Guardian gives part of the Manifesto, as well as giving us “Tarrant describes himself as a “regular white man from a regular family” who “decided to take a stand to ensure a future for my people”. He said he wanted his attack on the mosques to send a message that “nowhere in the world is safe”“, as well as “The document says his parents are of “Scottish, Irish and English stock” and that he was born into a “working class, low-income family”. When he was young, he was “a communist, then an anarchist and finally a libertarian before coming to be an eco-fascist”, he says“. I disagree, someone like that seeking the limelight to this degree is not regular, now it does not mean that regular people do not seek the limelight, they tend to not kill 49 people to get there, and in all this even his political path is up for debate. To go from a person who is part of a system of social organization in which all property is owned by the community and each person contributes and receives according to their ability and needs (by not killing people), so he moves towards the anti-authoritarian political stage that advocates self-governed societies (a view by self-governing people not inclined to kill others) and then he apparently becomes a libertarian seeking maximised freedom and autonomy, emphasizing freedom of choice, voluntary association and individual judgment again by not seeking violence. So basically he was rejected by all and became as he puts it an eco-fascist. That group will take any member as no one wants to be a member of that group in the first place. I don’t believe he has any significant level of intelligence. This all reads like a stage put in motion, the attack in London might link to it; it might merely be a coincidence of a few drunks being angry hearing about the New Zealand attack. I do however believe that the entire New Zealand event is giving rise that this might be larger and there are other players behind that event. The element that he was arrested in under 40 minutes, as well as the stage of “Screen shots were created from still frames of bodies and uploaded to sites like Reddit, 4chan and Twitter where they were shared and reshared“. Consider that 17 minutes needed to get downloaded to a device for uploading passed through for the screenshots, those and the movie needed to be uploaded, the timeframe does not match, he had support! The cyber specialists will have to look at the digital evidence on how fast and how evasive it was all done, more important there is every indication that there is a mirror to the dark web, implying now that this will resurface soon enough. In the next 15 hours the entire world will have woken up to the events in New Zealand and billions will be aware, after that I feel certain that the materials will surface again. It does not need to rely on Twitter, Facebook or YouTube, there will be other pastures sowing the fields of discord with the video and images. The small matter of the Cricket match, and the fact that the New Zealand and Bangladesh test would have been on in Christchurch gives rise to that thought too. It might be mere coincidence that the Bangladesh team was in that mosque, the luck might have been that he missed that group by mere minutes; the event could have been a lot worse if these players would have become victims as well. The BBC quote: “Bangladesh cricketers were “minutes” from being inside a mosque in which a fatal mass shooting in New Zealand took place, says team manager Khaled Mashud. Players and coaching staff were “50 yards” from the Al Noor mosque in Christchurch, when the shooting began” makes me think that this is larger than we can see at present. This was more than an attack; it was a planned strategy of slaughter and all the elements that I see is that a person like Brenton Tarrant lacks a massive amount of brain cells to do all this to the degree we are seeing at present, item three on that event list gives additional rise to my doubts. I would want to state that Prime Minister Jacinda Ardern and Commissioner Mike Bush have a problem, yet I am not entirely convinced that this is merely a New Zealand problem. There is no way to tell, but I reckon in a few days the cyber dudes (as well as cyber dudettes) will have a better timeline and a better comprehension on what methods, what software and hardware was used to get this all maximised, it might reveal more over time, but we will have to wait for evidence on that. part of that is also seen when we contemplate ‘The suspects were unknown to the police‘, the planning part and the fact that no red flags were ever raised makes me think that there are more players involved, the viral part of the attack is partial evidence. I reckon that more evidence will come to light soon enough proving my point. That was the first thought I had when the Guardian treated us all to: ‘Folding tablet hybrid shows Asia, not US or Europe, is leading the way in innovation‘, I was already aware of this through the submitted patents well over a year ago, yet the Americans remained in denial on just how far behind they were falling, ego does that, iteration does that and denial does that. Now I see that the innovations would optionally give added value to my own outstanding patent on a ‘dumb smart device‘, and it goes on beyond that. Some of the innovations I had planned for are now on par with what Huawei will need soon enough. Their foldable Mate X, which is allegedly 5G shows that not only is Huawei ahead of the game, I see that they might be more and more interested in my IP, giving me the retirement funds I really really desire. 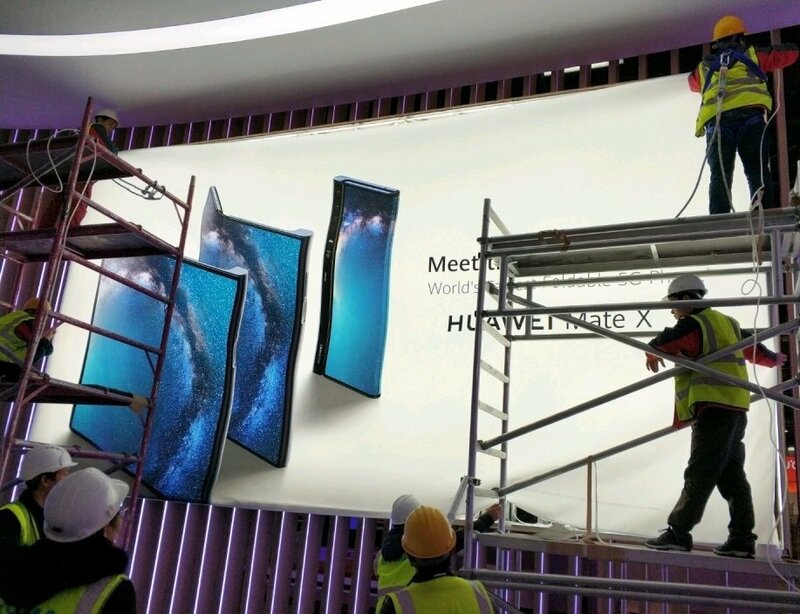 The Mate X billboard that was getting placed for the grand opening in 10 hours in Barcelona gives us the initial view, instead of hiding it in the middle like Samsung does, the outside fold might have additional powers and abilities that we have not considered yet and could optionally have the implementations that Android 10 will offer. Even as we expect the 5,000 mAh battery to be the power driver pushing Huawei all along towards to pole position, the device would have plenty of business needs for options like a potential Dark Mode, as well as DeX-like docking support for a new Desktop mode and a revamp of privacy options. Giving us that Apple is now falling behind and they are falling behind fast. In addition we see the escalations that are hitting Facebook will enable a much larger push towards the WeChat future that is now being considered more and more outside of China. Barcelona has more, even as the SanDisk 400GB is truly expensive (as well as superfast) as its 128GB is 75% cheaper at present, but that is the reality of larger memory when it is initially released. More important, when I look at the implementation of my IP, I see that the market for SanDisk would grow close to exponential from previous terms and I am sure that SanDisk will not object at all. And the news is not done yet. One source gives us; ‘After Samsung unveils Galaxy Fold, Apple submits blueprint for foldable iPhone‘, implying that they are losing grounds and are getting left behind by both Samsung and Huawei. Even as we are almost conned with: “Apple has submitted a blueprint of a bendable smartphone at the US Patent and Trademark Office (USPTO), indicating Apple’s progressive development towards building a foldable device” we see the issue that if the patent is submitted now, Apple would be optionally 2 years behind Huawei, the loss has been that much for America. As we see the news from CNet and ZDNet and a few others, we see quotes like: “Samsung has gotten the jump on the competition; companies like Huawei and Xiaomi could have the last laugh. While the Galaxy Fold wowed audiences with its demo, Samsung opted not to let anyone get too close to it, and the phone was MIA when the demo area opened up. Another company could steal the spotlight by offering people a closer hands-on with their foldable devices” and none of the articles had given any notion towards Apple implying that with the absence of ‘leaked reports‘ Apple is a no show to the degree that it matters. It was only through Forbes that we see: “In a perfect demonstration of the macro/micro concept in practice, the Wall Street Journal broke the news that Apple is shifting its leadership. The company is also changing priorities throughout its multiple divisions (retail, hardware, artificial intelligence and services).” All these group interview drives for their shops and now we see a massive division shift. It is not only that, they also confirm what I have been telling everyone for almost a year. With: “It’s like paying an even higher price for a bigger plate of the same food“, the part that the plate only seems bigger is left out (it is in the eye of the beholder) and when we consider the $2365 (Apple) versus $899 (Huawei), with a close contender (Huawei too) at $499 we see that there is a consumer group that is taking value into considerations making the technology of Apple slide even faster. So whilst their marketing division is trying to make sense of the premise of ‘Apple under fire as it admits some iPads ship with a ‘bendy chassis’ – but says the flaw in the $799 product is ‘normal’‘, all whilst the consumers wonders how stupid their train of thought is, and as we were treated to “This 400 micron variance is less than half a millimeter (or the width of fewer than four sheets of paper at most) and this level of flatness won’t change during normal use over the lifetime of the product. 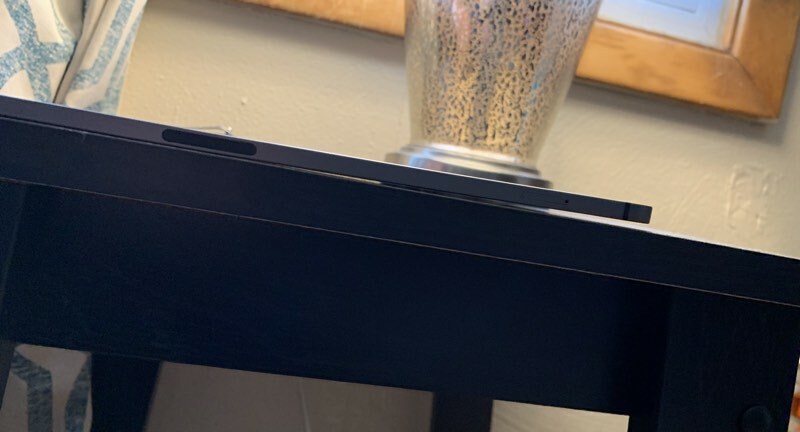 Note, these slight variations do not affect the function of the device in any way“, whilst the images (at https://www.macrumors.com/guide/ipad-pro-2018-bending-issue/) shows a “Bendgate” issue that is a lot bigger than their statement. As we are treated to issues a lot more severe, we optionally see an issue where Apple did not merely drop the ball, they went about it wrongly to address the issue and it is not going away any day soon. When we push this forward, is the fear that people with an optional future folded iPhone greeting the ladies in social events with an folded iPhone shaped like a giant ‘V’ that they are not happy to see them, they merely have an iPhone bendy in their pocket, and lets be fair, are you really willing to pay $2900 for an iPad that can’t stay straight? This part matters as Apple will try to take the 5G path growing its market share as we would expect Apple to do, yet at present Apple is losing speed and making less and less headway, it needs to realise that the Chinese path of innovation is taking steam out of the others and drowning whatever others consider to be innovation to the be a mere marketing exercise. Huawei started showing that clearly well over a year ago and now that 5G is here, the playing field is dominated by China to a much larger degree than anyone is comfortable with. In addition, what was laughed away by many a year ago when I showed that Saudi Arabia was making headway in 5G, is now given by the media as: ‘Huawei to help Saudi Arabia become world’s top 5G country‘, I was more conservative claiming that they would surpass the US in 5G, not that they would become number one, but the Global Times is more progressive here and with “his company will support Saudi Arabia in its drive, and Huawei is ready to invest $20 million per year in its three local research centers, cooperate closely with 140 local suppliers, procure $500 million worth of local equipment annually and add 10,000 local jobs in Saudi Arabia in the future.” The quote (at http://www.globaltimes.cn/content/1139737.shtml) gives a few issues to debate, but behind all this is still the Vision 2030 drive and Neom City the drive that Saudi Arabia has had from the beginning and as I stated many months ago, their need for 5G would be well received, a city that will in the end be well over 20 times the size of New York, all 5G and all innovation driven. That was seemingly just the beginning, because Huawei sees what I saw, Saudi Arabia is important and in the end the biggest springboard towards places like Egypt and a consumer base 300% the size of Saudi Arabia. From there several more markets will open up in several ways. In the end I have been proven correct five times over on this issue alone. Barcelona and their MWC2019 (Mobile World Congress) will show me to be correct in a few more ways. At this point, I merely wonder how often Microsoft will drop the ball there. I am supposed to remain objective, but how can I when we have seen this world where Microsoft innovation is merely limited to their marketing. Whatever we get to see at the MWC2019 this year, it is clear that when it comes to innovation, it will be the Chinese companies that have the last laugh, especially as President Trump announced: “I want 5G, and even 6G, technology in the United States as soon as possible. It is far more powerful, faster, and smarter than the current standard. American companies must step up their efforts, or get left behind“, and the fact that AT&T is hiding behind 5G Evolution (which is not even 5G) should be a clear indication how far the US is lagging behind, all the way to the White House. It is also the one moment where I clearly oppose Business Review who gives us: ‘Trump’s tweet won’t have much impact‘, you see, entertainment is priceless and that is what President Trump offers, 6G when they are still not grasping the options that 5G brings, and the ‘small’ fact that Saudi Arabia will soon pass them by in the 5G mobile field does not help the US either, there is no telling at present how far behind the US will be when 6G arrives in 5-10 years, but we can giggle on the sidelines whilst we watch it happen, can we not? We have been on the 5G track for a while and now, as players have been very adamant of taking the wind out of the sails of Huawei, we need to realise what they have, or merely what they have left. So to play nice with the Americans (and a few other governments), we have been drowning in all these new 5G devices, and close to exactly 2018 years after a girl named Mary forked out a little bub named Jesus of Nazareth, we were treated to all kinds of news like ‘New evidence confirms Samsung’s 5G smartphone for Verizon, codename Bolt‘, it seems that the writer Cosmin Vasile was on the ball, and I stipulate only seemed to be. For a former PR person claiming to be a tech journalist we gave him an initial pass. And when he gives us “However, Verizon announced early this month that it has teamed with Samsung to release a 5G smartphone in the United States in the first half of 2019. Now, we have more info that confirms the carrier’s statement” we get the image that there is something happening. It is only now that content creator Joshua Swingle gives us ‘Verizon’s 5G Samsung “Bolt” is actually a mobile hotspot, not a phone‘, so there we see the two parts that matter the most. The first “In actuality, Samsung’s upcoming device is a battery-powered mobile 5G hotspot. At the moment, details are pretty scarce, but a pair of Wi-Fi certifications (via VentureBeat) suggest there are two variants under development right now with the model numbers SM-V570N and SM-V570V“, and the second is “The Verizon model, on the other hand, makes use of Qualcomm’s Snapdragon X50 modem. This means it’ll be compatible with the radio frequencies used by the carrier for 5G in the US. While “Bolt” may not be the 5G smartphone everyone was expecting, Verizon customers won’t be missing out on anything. The number one carrier is still expected to offer a compatible version of Samsung’s 5G Galaxy S10 model when it launches“, the problem is that both sources are relying on Verizon to honestly inform them and that is where the problem starts, Verizon is in over their heads plain and simple. It is up against AT&T who rebranded some version of 4G as ‘5G Evolution’ and they are up against Huawei who is a lot more advanced at present, whether or not in America, others can judge Verizon for lagging behind foreign providers soon enough and that amounts to a multi-billion dollar fiasco. In addition, USA Today is giving the people “top executives from wireless powerhouses Verizon and AT&T will give keynote speeches where they are expected to outline why 5G will change the world. Both have launched limited 5G service in select cities, as consumers await the release of mass-market phones that can access the faster 5G signals. The talk will continue to heat up in February in Barcelona for the Mobile World Congress show, where more manufacturers are expected to show off new 5G phones“, we can argue how valid ‘limited 5G’ is, and whether it is actually a valid version of 5G, but that is a debate for later time. The issue of Verizon becomes more apparent when we consider GSM Arena, which in the past was a really reliable site (and it might still be), however (at https://www.gsmarena.com/there_could_be_as_many_as_five_galaxy_s10_models_lite_vanilla_plus_and_two_5g_ones-news-34909.php), we clearly see the S10 Bolt as a 5G mobile phone. I am willing to accept that GSM Arena is working on good faith with supplied information, in all this we need to wonder whether it is Verizon handing different sources different information, especially in light of: “the Beyond Bolt (Galaxy S10 Bolt) will be a Verizon-exclusive (and will feature a larger battery, though exact numbers are unknown at this point)“, which seen against Venturebeat (at https://venturebeat.com/2019/01/04/samsung-bolt-gets-wi-fi-certification-as-a-5g-hotspot-not-a-galaxy-phone/) where the people get: ‘Samsung Bolt gets Wi-Fi certification as a 5G hotspot, not a Galaxy phone‘, even as we cannot state for certainty how this all started, it seems that there is a clear path of deceptive conduct on a few levels. The entire deception part becomes more polarised when we look at Tom’s Guide who gives us “The fifth device will be known as the Galaxy S10 Bolt, Dutch blog TechTastic is reporting, citing sources. It’s unclear exactly how it’ll get its name, but some important features might tell the story. For one, it’ll work over 5G, allowing you to access the ultra-fast network in areas where it’s available this year. Additionally, Samsung will bundle a larger battery in the Bolt, according to the report. Lastly, it’ll be exclusive to Verizon.” The story (at https://www.tomsguide.com/us/samsung-galaxy-s10-bolt,news-28967.html) gives us a Dutch blogger as the source and they all repeat one another, so as Venturebeat is opening the eyes of many, we see that this game of deception is played on a much larger stage, optionally implying that Samsung and Verizon are working together to create visibility by trying to take it away from Huawei (which in the end is a valid marketing ploy). It is Forbes that give us clarity by not giving us any. It makes sense and when we see: “both Verizon and AT&T have announced a partnership with Samsung to deliver a ‘5G Galaxy smartphone’ in the first half of 2019. And yes, we know exactly what this is. “5G is going to be about more than just a network. Customers will eventually be able to connect in near real-time to unforeseen possibilities,” said David Christopher, president of AT&T Mobility and Entertainment. “Together with Samsung, we plan to bring the best in technology and innovation to our customers. The future we imagine with 5G is just beginning, and it is a great time to be a consumer.”” Forbes gave us the goods, as others are talking about the 5G Bolt part, Forbes gives us David Christopher who is seemingly informing us on how great it is to be a consumer, he leaves out the part where the consumers are getting misinformed. For the most we want to blame bloggers and technology reporters validly hiding behind words like ‘likely’ and ‘we expect to see’. Yet until the official unveiling in Spain at the end of February we will not actually know what is real and what is not. So how come that they all got it wrong? Well, they all merely seem to mimic and user each other as sources, propelling the fable forward (as I personally see it), Venturebeat did their homework and gives us (at https://www.wi-fi.org/product-finder-results?sort_by=certified&sort_order=desc&keywords=SM-V570V,SM-V570&companies=362) the certification sources. There we see (see image) and more important, we see that both are: ‘Category: Mobile Access Point (battery powered)‘, there we see the adults and the children separated, from what I can tell Venturebeat did its homework, the rest got used as the tools they seemingly are. That remains to be seen, unless we see at the end of February that Samsung is revealing an actual S10 bolt as a 5G mobile phone, these writers were tools to be used for the entertainment of Verizon, to create a marketing hype on a false product, if there is an actual S10 bolt being released, it also implies Samsung to be part of all this. You see, you do not give two different devices the same name that is a marketing no-no on a very high level. So far we have seen the actions by AT&T and now Verizon as well to be hiding behind the ‘be first’ tactic and not actually being there. It is as I wrote yesterday (at https://lawlordtobe.com/2019/01/04/dianhua-x2-xinche-xing/), “these players are putting it all one the table, betting everything they have to make a 5G turnaround whilst there is more than one indicating chance that this will falter. That is the gambling stage and all this is done without realising that Huawei does not need to bet, they merely have to deliver what they are promising making the others fold, losing it all over hardware that they cannot provide, or even better are already failing to manufacture“, and by the way, my premise was supported by quotes in the Wall Street Journal, and a few other highly respectable publications on the global scale, I knew what I was looking into. I partially hoped to have been wrong, yet less than 24 hours later we see additional sources merely proving my point. In addition, PC Magazine gives us only 9 hours ago (at https://www.pcmag.com/news/365649/surecalls-5g-booster-cant-extend-at-t-verizon): “AT&T is flat-out calling gigabit 4G “5GE.” Real 5G—5G NR—is coming on a range of frequency bands up and down the spectrum, with the first round of 5G phones and hotspots only supporting some of them“, as well as “Those bands, called millimeter wave, are what Verizon and AT&T are launching first, and they provide tremendous speeds but at very limited range. Unfortunately, the FCC hasn’t even set the rules for millimeter-wave boosters yet, according to SureCall CEO Hongtao Zhan, so those will probably come next year. “I don’t believe we’re the bottleneck of this. There’s no rule, there’s no standard, there’s nothing,” he says. Millimeter-wave boosters can’t be built yet, but Zhan says that’s where we’re really going to need boosters. Millimeter-wave frequencies have trouble penetrating walls. “There will be zero signal inside your buildings; it’s going to be horrible. Something has to be done to solve that problem”“, so not only is 5G a mess, there will seemingly be no reception in the building, so why buy into 5G for now? And is it not interesting that the consumer is mostly unaware to all this? In support we also get: “In my experience, he’s 80 percent right. Verizon has shown me millimeter-wave signal penetrating at least somewhat into buildings, but it drops off pretty quickly. There will definitely need to be some sort of in-building booster for millimeter wave, if the carriers want that frequency’s advantages to work inside.” All that information is missing form so many sources. At least, for me personally there is an upside, with all these additional needs, the need (and value) for my IP is growing close to exponentially, so I feel decent for now. Yet, the people who seem to adhere to David Christopher, president of AT&T Mobility and Entertainment and his view of “a great time to be a consumer” with all the non-given information, at what point will we use these publications to start up class actions against certain players to get 100% refund on hardware we get to keep? What level of punitive damages with the US courts and other courts define as ‘non damage’ and therefor non claimable just to keep AT&T and Verizon afloat? America is all about suing people, not about holding them accountable and that is something we might see change in 2019, the entire 5G mess is becoming a plane of deception giving rise to certain people and their plans of deception to keep the interest focussed away from other players in this field. And that is not even the start of the failing we see in the US, according to the Gulf Times (at https://www.gulf-times.com/story/617959/Vodafone-one-of-the-first-to-go-live-with-5G-comme) where we see: “From today, GBI will be the first entity to be commercially connected to Vodafone’s 5G network. Moreover, Vodafone Qatar will be the first to commercially connect several consumer customers to its 5G network across Doha starting today. “We are proud to have been the first company to experience the power of Vodafone’s 5G network and now look forward to benefit from it commercially to enhance our operations. We congratulate Vodafone on officially receiving its 5G licence and extend our full support in the journey to accelerate the country towards becoming one of the most technologically advanced in the world,” said Abdulla al-Ruwali, GBI executive director and managing director“, and it is not AT&T, or Verizon. It is Vodafone of all places that has switched it on, completely licensed. Now, this is merely one source, although I got it via Reuters, there are optionally still issues in place and the debate is not over, but there you have it, the US claiming all kinds of stuff and the 5G trophy goes to the Middle East, how is that for a reality check? The 5G market is a Wild West stage and now we see (or are implied to be notified of the fact) that the camel jockeys and not the cowboys (or Indians for that matter) that seemingly take the victory cake home for now. It is not a setting, not a statement; it is merely the observation of what we see happen. Yet the question becomes who is who? It is a setting of placing Interserve next to the Cardigan Integrated Care Centre that is where we see a situation evolving. And it would not be a London project that is in danger, would it? Why the situation? It is the timing, even as everyone is still ‘working with’ and ‘LOCAL health board officials are confident that Cardigan’s new £24m health care centre will not be affected by the financial problems of outsourcing company Interserve‘, I am less certain that this will not have an almost deadly impact on the project. The article (at https://www.tivysideadvertiser.co.uk/news/17301424.interserves-problems-should-not-affect-cardigan-integrated-health-centre-project/) gives the people none of that and as far as I read the article, there is nothing there indicating the views I have, yet the setting is already staged to become worse, much more worse I might add. That is an easily given fact as the project is not due until the end of 2019. You see, the article also gives us: “Interserve is responsible for delivering the project but there are fears over its future after it confirmed it was in rescue talks that would see retail shareholders virtually wiped out and creditors take control.“ Yet that is not the directive part in all of this, and the article (through no fault of it, or its writer) gives that part to the reader. You see, that part we get when we contemplate ‘Struggling Interserve may hand construction unit to lenders‘ (at https://news.sky.com/story/struggling-interserve-may-hand-construction-unit-to-lenders-11581667). the first question that rises, if there is such a debt, why would we see: “drawing up plans to hand its £250m building materials unit to its lenders as part of an ambitious plan to secure the company’s future“, which is a choice, yet when we see another article also giving us: “Outsourcing giant Interserve is preparing to spin off its lucrative building materials division in a bid to reduce its debts“, so why would a ‘lucrative’ part get sold off? Lucrative clearly implies the part that allows for a much quicker turnaround and in absence, that lucrative part used to keep the lowest bidding in place will also (optionally) drastically increase the cost of projects when it falls away and that is where the Cardigan health centre find itself optionally soon enough. We might think that ‘RMD Kwikform makes equipment used to build concrete structures‘ is no indication, yet this equipment is often merely leased per project and a new owner implies new (or additional) fees or another destination for that equipment, changing the entire setting of the project and experience, as well as history taught us that a board in trouble does not tend to care too much about their running projects. That remains to be seen, because there are several factors in this that are unknown, yet the setting that the project is a year away implies that there are plenty of stages uncompleted and they are therefor at risk. The fact that this news is 2 hours old means that there is no given setting, yet the large impacts will be seen in the next quarter and that is when the pennies drop for several projects, the question is on how the stage will be maintained. The fact that Interserve stock has been reduced by 45% and when we consider that the Interserve board is close to a month away from revealing its plan, as well as the fact that this thunderstorm has been looming for over a month does not help matters. The Financial times is giving us another setting here. With ‘UK government to continue awarding contracts to Interserve‘ (at https://www.ft.com/content/03f63e62-fd41-11e8-ac00-57a2a826423e), we saw that the government last week was setting the stage for Interserve to get some deals going as these projects mean money and money coming in is always a good stage to continue the work. So when I see “Government sources told the Financial Times that it does not view the company as another Carillion— the contractor that failed in January — and that it would consider Interserve for further tenders“, we should consider it as a partial truth, when you are down in a debt that soon will be pushed towards an approaching £1,000,000,000 (as I decided to round it towards the worst case scenario), we need to realise that something has gone terribly wrong, That amount approaches to the annual income of 32,000 construction workers, and their pensions, so there is another side to investigate soon enough (although we do acknowledge that the Interserve pension is high in the green). That remains to be seen. The fact that this large a debt is an issue on something this big needs to be scrutinised in several ways, not merely what is to come, but how come the debt is there in the first place. Improper pricing, inefficient project management, wrongful costs are all stages here that pushes additional costs through the roof and that is where it all hurts, and without proper vetting the pain remains and we will see additional projects operating at a loss. that part was given by Construction News in April this year when we got ‘Interserve suffers £244m loss for 2017‘, the quote “an “inefficient operating model” with high overheads had left the firm “exposed to weaknesses” in the support services and construction industries” by chairman Glyn Baker is clear enough, the wrongful setting and we see an amazing growth of losses and debt. the fact that we were given the implied “Interserve said the business will need a “significant de-leveraging event” to stay viable, which would likely be an asset sale, or raising further equity before December 2020“, which against ‘cut costs by £15m in 2018, and is on course to add £40m to £50m to operating profit by 2020‘ sounds almost like a joke, to with a debt over 800 million (conveniently rounded to a billion by me), we see the mention of “limiting the cost issue by 1.8%, whilst adding debt reduction by 5% in two years’ time is exactly the message in a stage how we should read it, A Joke!“, oh and that is all whilst in those 7 months £300 million was added to the debt, is anyone waking up yet? In all this, Interserve has gone from bad to worse from 2015 onwards, all whilst some might expect that with Carillion out of play, options for Interserve should have opened up, no matter how bad the market was, one larger player was removed. A reliance on acquisitions and cost cutting. High debts both on and off its balance sheet. A big pension fund deficit that needed large amounts of cash flow to reduce it. A difficulty in converting operating profits into operating cash flow – a classic sign of poor profit quality. The need to sell assets in order to maintain and grow dividend payments. At what point did we not consider the massive danger Interserve was in? The events that I have been able to track go back to early 2016, The Financial Times in May 2016 and the Independent in August 2016 give us some of the goods, in addition there was Forbes in 2017: “Overruns lead to £70m charge for construction and services group“, as well as “The Reading company advised that a tight control of working capital across the rest of its business last year substantially offset the adverse cash impact over at EfW. Consequently net debt clocked in at between £270m and £280m as of the end of 2016“. It is the fact that we see a clear level of inaction (or bad management) that gives rise to the situation, the fact that these issues were clearly in place almost 2 years ago, gives rise that the government had a clear duty to intervene to some degree, that level might be up for debate, yet the ‘let’s leave it for now’ and the presentation (at https://www.interserve.com/docs/default-source/investors/financial-reports/presentation-results/2018/h12018-results-presentation.pdf) now give the consideration that there is every chance that shareholders might be seeking legal counsel. You see Interserve ‘presented’ the so called facts: ‘Fit for Growth initiatives delivering savings and creating a simpler, more effective Interserve‘, as well as “Overhead reduction and efficiency measures to deliver £15m savings in 2018“, gives serious contemplation that the shareholders were not properly informed of the dangerous place that they were in at that meeting in August 2018. In addition, slide 20 gives rise to another contemplation; the fact that two posts (Manufacturing and Regulated industries) are set to a marker size of £22 billion, 2 out of 7 mind you, and we see the losses incurred, we see additional worries on management and pricing. Even at a 1% margin, we should see £220 million in the plus for these two alone, the fact that the overall is set to minus £800 million, and a mere positive move of up to £50 million is a much larger debate and as such, one might argue that there is a lot more going on in the negative of Interserve that we might think. In opposition to my own view, I am in several ways comparing apples, pears and oranges and merely labelling the items as fruit, which in itself is not correct either. However, from my point of view, I see a tradesman dealing in 22 billion pieces of fruit and when left with a certain minus to this degree gives clear indication that the entire business model is wrong on a few levels giving additional worries on the earlier reported premise of ‘The need to sell assets in order to maintain and grow dividend payments‘, the conceded view that selling of your land year after year just to look good implies that the farm devaluates with every year and when we see that this has happened from 2016 onwards, the signs given should have been louder by many players and that (to the best of my knowledge) has not happened. When we consider the elements, we can also give rise to what needs to happen. If Interserve continues on this path, there is every indication that we see sell off after sell of, with an optional class action against Interserve, implying that the damage increases, so those projects set for delivery in late 2019 and 2020 (A Wales health centre for example) will find themselves on the coroners slab whilst the media looks at the intestines coming to the conclusion that at present there was no way to save the patient, and when we see that, how will that affect the £25 million Merthyr’s Prince Charles Hospital in Merthyr Tydfil? These two are close to £ 50 million, something will have to give and where will the government spring in when they have to? Will they do that? This does not mean that this situation explodes to that degree, but the signs of patient Interserve are not that great at present. And should there be an interception to protect these two projects, does that imply that Interserve is ready to be shipped to the morgue? That is the foundation of it, because the stage we see now implies that you can save one, but not both. The stage to the degree as I am seeing it should not allow for it in the first place; it does open up new options that as Interserve breaks down we will see new players come to life, perhaps one per construction project, yet that too has the danger of costs going overboard in a large way really fast, that is the nature of the beast, merely because the largest players implying to have the costing down to a margin is a mere 1%, smaller players can never do good on that promise, showing us that costs will overrun on all projects by a fair bit. To see that in a much more local London setting we see places like the Aecom tower and the stage where ‘overly enthusiastic‘ contemplation was set until we got: “profit was “lower than expected due to the losses taken on an underperforming project in one of the company’s core market segments”“. This matters, there is a speculative approach to construction projects and the stage is not merely on how things are pushed, it is on how pricing models are staged and presented by all and that requires a much larger oversight, or better stated, it needs additional scrutiny on a few levels. There is a stage that clearly is part of the Interserve failure. Even if the ‘new’ model implies that we might optionally see: “the tower will now house 861 apartments of which 765 were for private sale, the adjustment now allows for a private sale of 813 apartments“, screwing over even more social housing points. If that is allowed, certain councils should be overhauled and those parts of the stage allowing for that should be required to be facing the dock and optionally dismissal of the project as well as the investment amounts to be considered a total loss. There is a lot wrong in this entire stage and it all started with optional pricing models that were seemingly not realistic in the first place. Carillion clearly showed that element as I personally see it and whilst the board of Interserve is contemplating what to do over the next few months, they to require a level of scrutiny that is a lot larger than anything we considered before. The Greenland Group and Aecom, merely illustrate that what we are seeing in the Battersea Power Station debacle as well as a much larger stage of construction jobs out there (Interserve pricing anyone?). So when the Financial Times gave us merely a day ago: “A refinancing arrangement between its Malaysian owners has been delayed for the third time; the cost of labour and materials is increasing; the developers have more than halved their expected returns and there are disputes with Transport for London over the cost of the Northern Line Underground extension to the area“, we see that the pricing stage for construction companies (as we clearly see with Interserve) is a much larger concern, we could argue that someone is dampening the cost and margin part merely to get things started and in that trend, we might need to consider other avenues. Perhaps consider nationalising projects in this stage and those shareholders and investors will have to live with their 100% losses. Why leave this level of unacceptable pressure on taxpayers and governments? And the fake messages of keeping Britain good for investors also required those pricing goons to consider that it comes at a cost. If the players cannot do their job, then those hurt must seek legal consideration against those firms using flaccid pricing models, making matters worse for Interserve, but should we actually care at that stage? There is every consideration that Interserve goes to the Hospital whilst the projects in wales go to the morgue, but personally I do hope that it is the other way round, as the Battersea Power Station project implies (and a few more beside that); the entire problem on construction has been around for close to 5 years, implying in my personal opinion that these problems started long before Interserve was in the deep financial problems it currently is in, giving rise to several issues that require discussion in the House of Lords at the very least, and perhaps starting the discussion of that agenda no later than week 2 of January 2019 would not be the worst idea as I personally see it. Do you want to see an avoided discussion on how a health centre went to the morgue no matter where it was supposed to be built?